The Gay Gamer: But I thought Nintendo was killing off the DSi XL? But I thought Nintendo was killing off the DSi XL? As if that isn't strange enough, said DSi XL will be sold at the same price ($169.99) as the still-trying-to-gain-a-foothold-in-the-hearts-and-minds-of-consumers 3DS. Now, I'm no business guru, but wouldn't it be better/smarter to, say, release a pink 3DS rather than a pink DSi XL at this point in time? 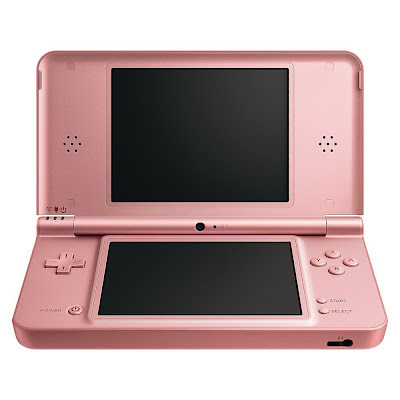 All that said, I'd totally pick up one of these DSi XLs if they were the same color as the "coral pink" DS Lites that took up space on North American store shelves a few years ago. I thought it was weird too. Personally, I never even understood why the DSi XL even existed, but why try to keep it there when you want the 3DS to take off? Oh, I understand why it existed, Marcus: 1) huge screens, 2) wide viewing angle (so multiple people can play/watch at the same time). Honestly, I'm more surprised they kept the DS Lite and/or DSi around as long as they did. IMO, they should have killed one of those two off when they released the DSi XL. Yeah, the worst part about this IMO is that it's an ugly shade of pink :P The pricing part of the equation is stupid, but what can you do? Oh, and don't scream. You have your 3DS and enjoy it, right? That's really all that matters! Yup. And when I went online and finally figured out where to download my free NES games for being an Ambassador--which was a place buried DEEP in the menu subsystems of the 3DS...which made no sense--I got my loot. Ah, yes, I read about the hoops people have to go through to get their free NES games. Oh, NIntendo ... never change! Still, you have them now. Are you enjoying them? Which ones are you playing the most? I really hope they release them (for $$$, of course) for everyone else eventually, as I'll definitely want to buy some of them when I get a 3DS. I also hope they make more of those "3D Classics." Have you tried any of those yet?